January 17, 2019 By Lori 4 Comments THIS POST MAY CONTAIN AFFILIATE LINKS. PLEASE READ MY DISCLOSURE HERE. Clean, fresh, vibrant with a big dose of ZIP. A salad that brightens the bleakest of Winter days with a dressing bursting with citrus, spice and honey. You’ll want to eat it the whole month of January…and February. Living in the Midwest, we celebrate the seasons with gusto. In our house, the seasons aren’t just Winter, Spring, Summer and Fall but more like guacamole and margaritas (May-September), chili and pumpkin bread (October/November) or spaghetti season (the whole year). Here, December heralds mandarin orange season marked by Santa tucking one at the bottom of each kid’s stocking every year and continues until the buds form on the trees (which can’t come fast enough for me). 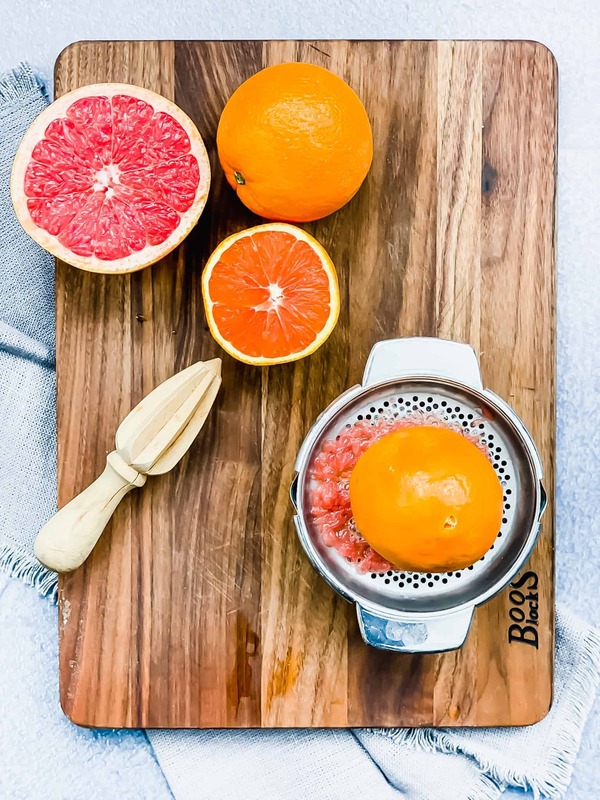 During winter, the markets are brimming with bushels of oranges like Cara Cara, Valencia, blood orange, tangerines and the different varieties of grapefruits like the pomelo. Grocery shopping recently, I gathered a bunch in my cart secretly hoping they would transport me somewhere warm. The second best alternative was to make a salad that could chase away the gloomiest winter day. 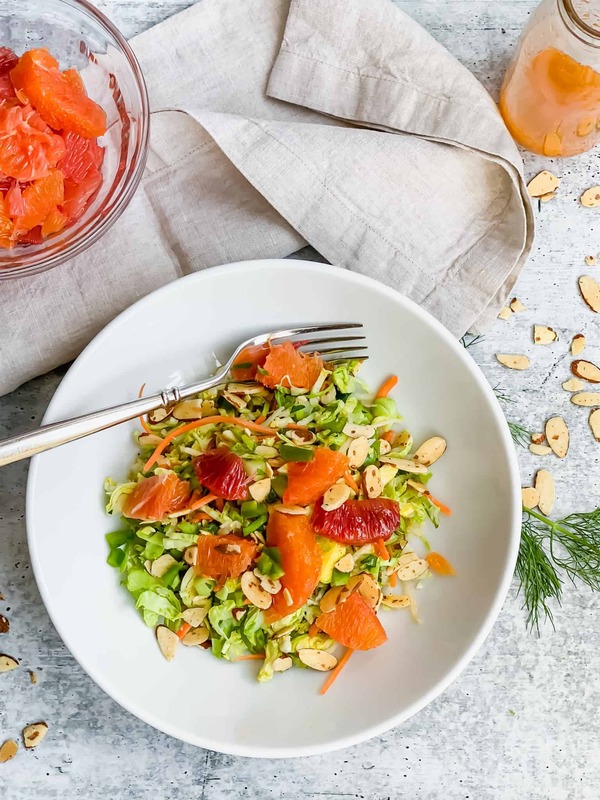 Cara Cara oranges, grapefruit and blood oranges bring their crazy, sunset colors while shredded Brussels sprouts and fennel offer a little bitterness. More green veggies like celery, green onion, parsley and jalapeno keep the colors clean and lend a spicy crunch. 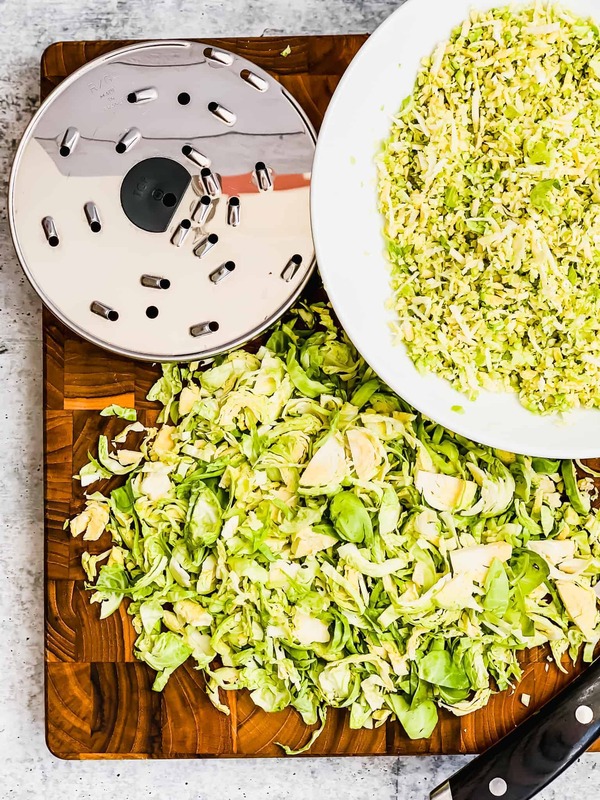 food processor – you can shred the sprouts with a food processor shredding disk. I am showing a picture of where I shredded the sprouts by hand (lower left) and by using my large shredding disk (upper right). You can see that even though it was my “large” disk, the sprouts are almost riced. It all depends on the texture you want. knife – trim the bottom of the sprouts to remove the stem.Throw away any tough outer leaves that fall off. Slice them in half from root to tip and lay the flat side down on your cutting board. Starting at one end, thinly slice the sprouts and using your fingers, gently break apart the leaves. 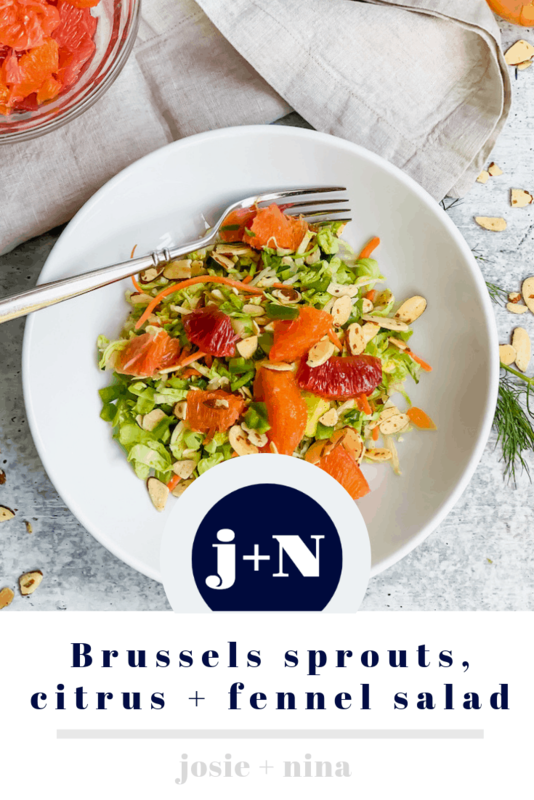 Head to your nearest Trader Joe’s or grocer’s produce section and purchase shredded Brussel sprouts. You’re welcome. 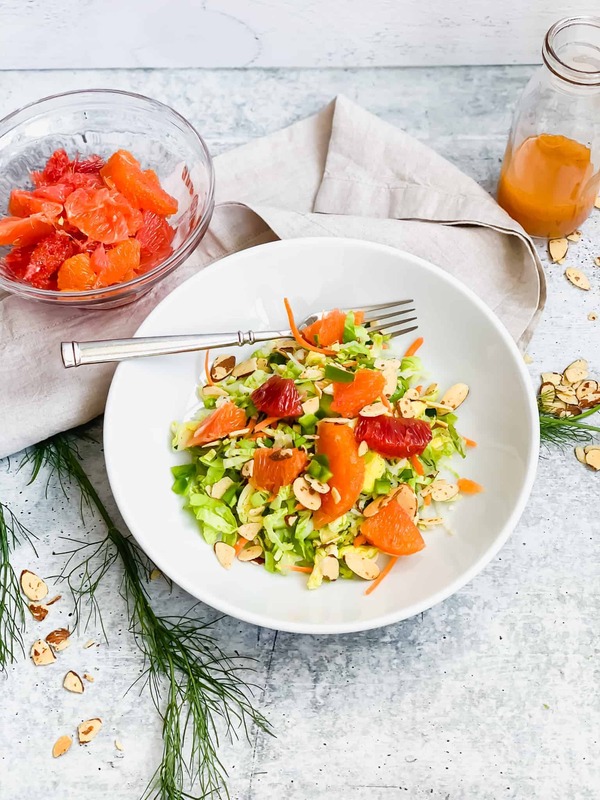 For the citrus, removing the skin and membrane from the grapefruits and oranges is what makes this salad so pretty and colorful. I include directions in the recipe how to do just that with a sharp paring knife. Or you can refer to #3 above and buy some already sectioned. You’re welcome. I wish I could help you with the fennel. 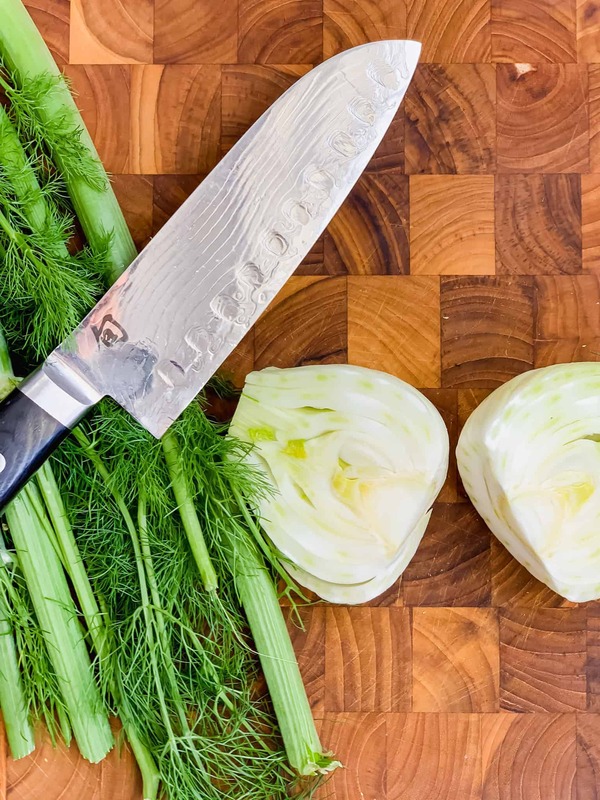 You might get lucky and find it sliced but if not, fennel is really easy to trim. You cut the long stalks right where they meet the bulb and cut a slice off the bottom so the bulb will sit flat on the board. Standing up the bulb, cut right down the middle and then similar to the sprouts, lay the flat side down and thinly slice the fennel from tip to root. Now the best part. I’ll be honest‒ my favorite part of any salad is usually the cheese. This salad doesn’t have any cheese so the dressing has to be killer. It checks all the boxes because it’s part tang, part sweet and has a nice touch of heat that balances all the flavors. And it’s so easy to pull together because you use the juice from part of the citrus that you’re already buying along with other ingredients you likely already have. cut recipe in half. would be great in a wrap or with your favorite taco. I like to call this the Sunshine Salad because it can brighten up any meal or day - especially in the middle of winter. Slice 1 grapefruits and 1 oranges in half and juice 1/2 of each. Reserve the other halves for salad. With a small paring knife or utility knife, start at the top of the orange and slice down around the outside to remove the peel and pith (white part). Continue making your way around the fruit. Once you have the fruit peeled, take your small knife and gently work between each section to remove the fruit from the membrane. Place all fruit into a small bowl. You can cut some in half and keep some whole for garnishing. 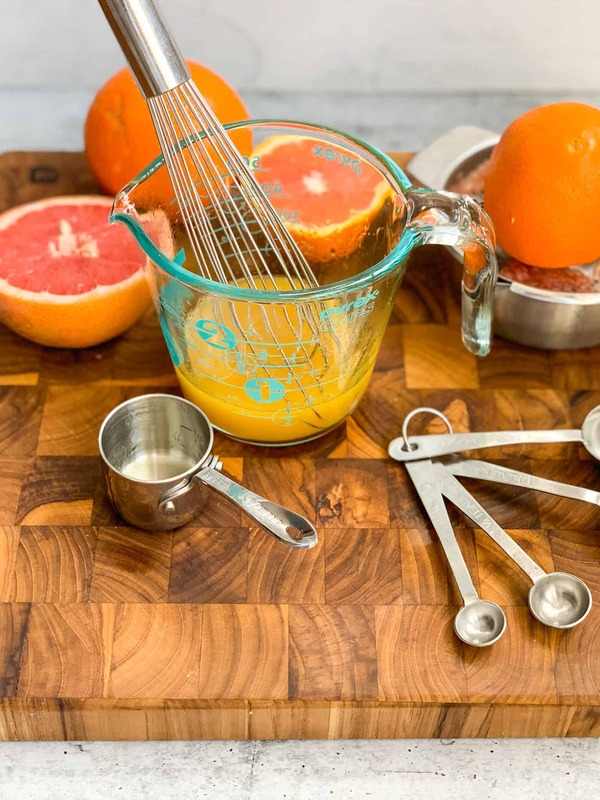 Pour the citrus juice into a measuring cup. To the citrus juice, add the honey and slowly pour in olive oil while whisking to create an emulsion. Season with the salt, pepper and hot sauce. Taste and add more if needed. Set dressing aside. Wash and trim Brussels sprouts. Thinly slice by first cutting in half from root to stem. Lay cut side down and slice across from root to stem again. Peel apart the layers and add to a medium bowl. Alternatively, place Brussels sprouts in a food processor with a large shredding disk and run according to manufacturer's instructions. Remove stalks from fennel bulb right where the bulb and stalks meet. Cut a slice off the bottom so the bulb can sit flat on the cutting board. Slice the bulb in half from tip to root and lay flat side down on cutting board and thinly slice across the bulb from tip to root. Add to bowl with sprouts. 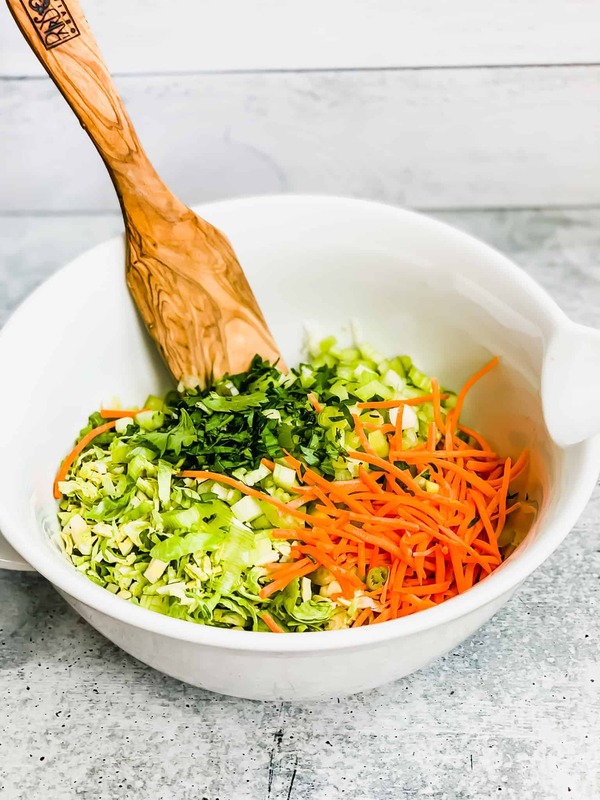 If using pre-shredded carrots, add to bowl. Otherwise grate or shred carrots first. Add remaining vegetables to sprouts and fennel. Lightly toss the salad with the dressing but don't overdo it. Garnish with fruit and almonds. Lori, Congratulations! First, on the launch of your new site! And second, on successfully impressing my kids! I’ve been looking for something different and refreshing and this totally fit the bill! My teenage kids even liked – actually, LOVED it! This is the 3rd or 4th time making it for my family in the last few weeks. It pairs nicely with everything from Shepards Pie (with lamb and sweet potatoes) to pork tenderloin. 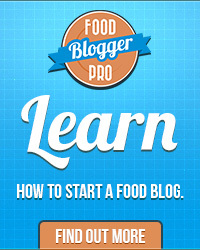 Yummy, keep these awesome recipes coming! Hey Molls!!! This makes me so happy! Glad to hear that they like it. I get the picky teenage thing for sure and now they’re adults with major opinions 😉 Hope you are well! Let me know if there’s something your kids want to see – I love a challenge! The colors in this salad are absolutely gorgeous! I’ve been getting more and more into adding fruit to salads, and I can’t wait to try this recipe! Thank you! I really love the pop of color and of course the flavor – especially in the dead of winter when everything feels so drab. The brightness has to come from somewhere especially since I’m in Chicago!